Drinking Guy Hoodie - You know someone who loves drinking guy and knows to joke about it? This hoodie will help you make him/her laugh. 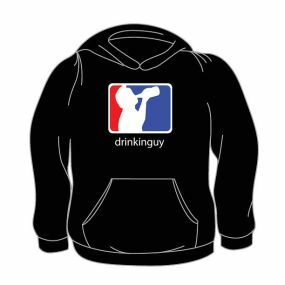 Our Novelty Drinking Guy Hoodie is under the Novelty Funny Hoodie Category of our Humorous Tees section of our store. It is one of our favorite selections in the Novelty Hoodie group of our huge collection of Funny Hoodie and Shirts designs. Displaying one of our most popular designs. This soft and cool feeling tee makes a great gift for the person who likes Humorous Tees or Funny Hoodies. All of our Novelty Hoodies and Funny Tee Shirts within our Humorous Tees section as well as our Drinking Guy is first quality hoodie made from a 50/50 cotton-poly blend. Every one of our humorous novelty tees are incredibly comfortable and are made to last. This Drinking Guy Hoodie comes in your choice of the colors shown and in men's sizes from S to XL. If you have any questions or suggestions regarding our Drinking Guy Hoodie or any of our other Novelty T-Shirt within our Funny Tee Shirts section or the Humorous Tees group, feel free to send us an e-mail and include the product name and number.